Screening date is fast approaching in which i believe that JAMB candidates of different universities should be getting ready. But what is the use of getting ready for the POST UME screening without knowing how to clarify some requirements you will need for the POST UME screening. I know you don't want to stay at home again for another one year to resit for another JAMB exam. This is more reason that you should read this post carefully. I have come across different candidates that does not know that the ORIGINAL JAMB RESULT is different from the ordinary JAMB RESULT. You might even be wondering that how are they different moreover result is result either ordinary or ORIGINAL. 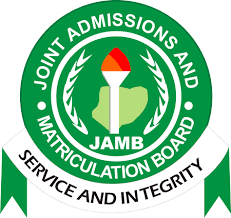 But I have come up with this post to enlighten you that in this case, result is not result, i mean that the ORIGINAL JAMB RESULT is different from the ordinary JAMB result. I have heard someone saying that the difference between the ORIGINAL JAMB RESULT and the ordinary JAMB result is the colour but that is not true, the colour only depends on the type of printer used to print the result. 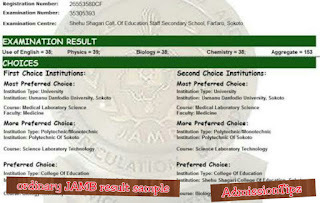 Ordinary JAMB result can be either coloured or not coloured, the same goes to ORIGINAL JAMB RESULT also. Ordinary JAMB result: The ordinary JAMB is of two types, the old format and new format. The new format was introduced this year, what i mean by new format is that the design and layout of the result is different from the old format. You all know that moment when you hear that JAMB RESULT is one t and you have to go to the cybercafe in order to print the hard-copy of your result. The hard-copy you printed at that moment is the ordinary JAMB result. The ordinary JAMB result is just for you to see your result, after that it does not serve any other purpose. What did i say that? Simple! 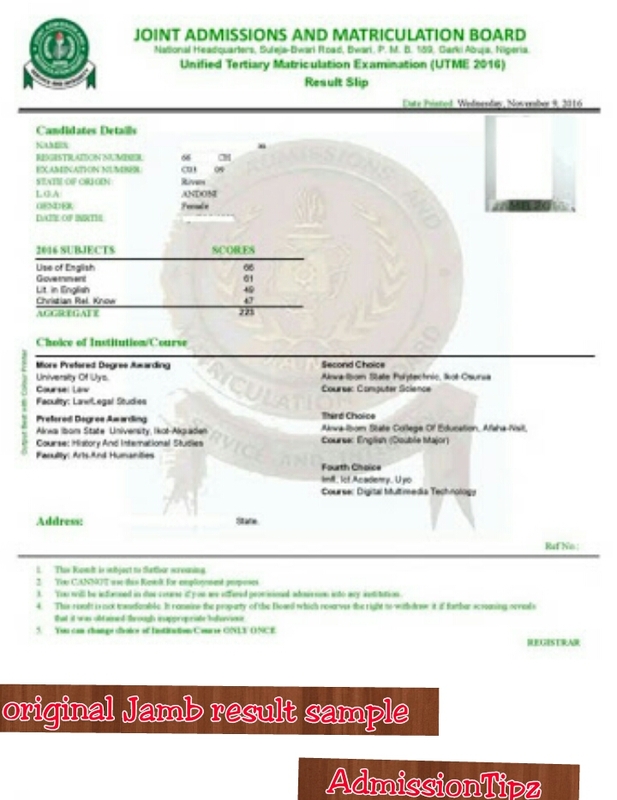 If you look at the bottom of the old format of JAMB result, you will see where they wrote "NOTE", under this you will see where they wrote "you cannot use this document for employment or admission purposes". Now you see what i am trying to pass across. Also, you will notice that there is no picture of the candidate on the JAMB result. Now that you have know how to identify an ordinary JAMB result, let's talk about the ORIGINAL JAMB RESULT and how to identify it. 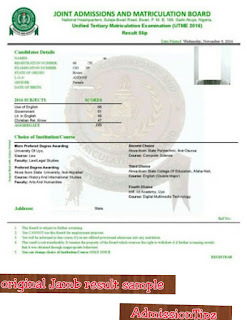 ORIGINAL JAMB RESULT: This result can only be printed out when the candidate purchase a scratch card online or offline. After you have purchase the scratch card, you will log in to JAMB site to do the necessary procedures. 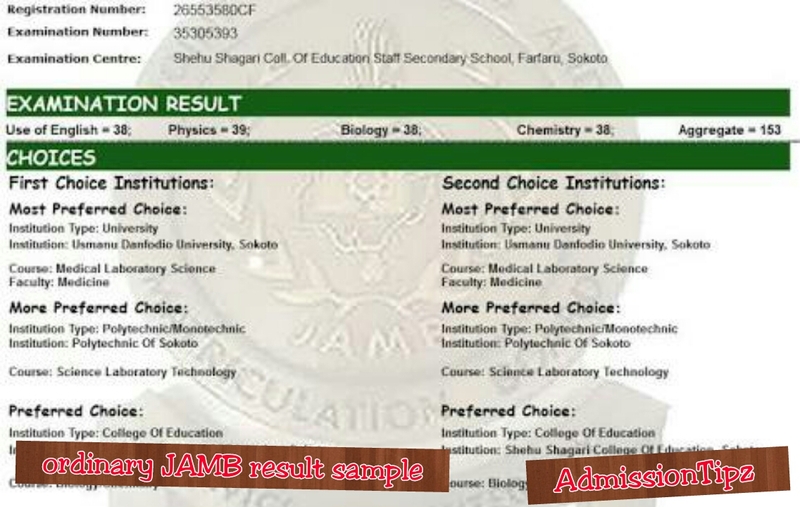 You can identify ORIGINAL JAMB result by the picture of the candidate on the result. It is the result you present to the admission officers during admission SCREENING. Now that you can differentiate between the ordinary JAMB result and ORIGINAL JAMB RESULT, you should now be fully ready for the upcoming screening. I see the need to enlighten student about some little things that they might want to ignore. Who knows, this might be an hindrance to their admission. I derive joy in giving out information to make admission easier for Nigeria student and for foreign students planning to study in Nigeria Universities. I hope this post was helpful and useful, if you find it helpful you can do me a favour by sharing this post to your friends on social media by using the "share" link below this post. Also remember to drop a comment if you find this post helpful. Your comments are my motivation. 0 Response to "Screening requirement: know the difference between ordinary JAMB result and original JAMB result"